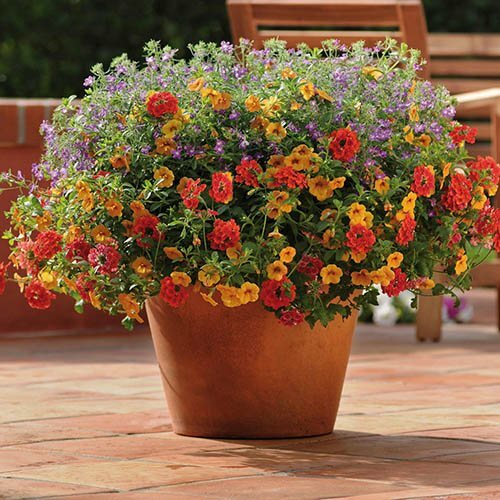 Ayers Rock is a warm, bright and zingy blend of Million Bells, Trailing Lobelia and Trailing Verbena. A single 'Trixi' 3-in-1 plug will fill a 10-12' diameter hanging basket. This revolutionary new way to plant and grow your patio displays will reduce your workload but also ensure you get consistent and predictable results every time! This revolutionary new way to plant and grow your patio displays will reduce your workload but also ensure you get consistent and predictable results every time! It is the result of extensive trialling and testing that means you have 3 perfectly co-ordinated 'plant partners' growing happily together in each of the super-sized plugs - so they will not only look great together, but also grow perfectly in tune with each other throughout the entire season too! A single 'Trixi' 3-in-1 plug will fill a 10-12' diameter hanging basket. Delivered as extra large plug plants ready to plant directly into containers and baskets. Each plug contains three sepertae plant varieties which have been selected to grow perfectly together.